As long as USC has been in existence, there has been music in the air. Musical instruction was listed in the university’s first catalog in 1880, and the first USC band was started in 1881. A student served as band director, and although the group had no specific functions, it practiced marching on the race track in Agricultural Park (today’s Exposition Park). Over the next few decades, the band existed intermittently, always with a student director. Once the first professional director was hired in 1910, however, the band started to build a reputation for excellence and a high profile. It played for John Philip Sousa in 1924, and in 1932, it formed the nucleus of the band for the Xth Olympiad. It pioneered the stylish uniforms and drills that today are its trademark—innovations that were quickly imitated by college hands throughout the country. It performed at all rallies and games, and in addition to its musicianship, it became known for wacky stunts. was the hiring of Dr. Arthur C. Bartner as director in 1970. Within a few years, Dr. Bartner had transformed an 80-member organization into one of the top ten collegiate bands in the country. By 1978, it was a 250-member powerhouse with an international reputation and began to amass an extraordinary number of honors. Also known as the “Spirit of Troy,” it has appeared in numerous Tournament of Roses parades, several films, the opening ceremonies for the games of the XXIIIrd Olympiad in Los Angeles, various Super Bowl halftime shows and festivities for the fiftieth anniversary of the Allied Invasion of Normandy, to name a few. It has also appeared on the Academy Awards ceremony and has performed for several U.S. presidents. In 1979, it recorded the hit song “Tusk” with the rock group Fleetwood Mac and saw the recording go platinum. Ironically, until the 1920s, the USC band was largely overshadowed by a more popular musical group: the USC men’s glee club. Considered the best on the West Coast, according to the 1912 student handbook, the men’s glee club was well-known on the concert circuit, with an annual tour that included a stop in Chicago. Other early USC musical groups included a women’s glee club, a university orchestra and a choral club. The Madrigal Singers were founded in 1939 and the A Cappella Choir in 1945. Musical excellence took on a new dimension at USC in the mid-1950s, when students across the campus decided to commit their musical talents to philanthropic ends. The cause was Troy Camp, a student-run charity that sent disadvantaged kids to summer camp. The vehicle was Songfest, conceived by undergraduates Robert F. Jani and Robbie Carroll as an all-university singing competition that would double as Troy Camp fundraiser. The first three Songfests were held in the Greek Theater and played to capacity crowds. In 1957, the event was moved to the Hollywood Bowl to meet the growing demand, and subsequent Songfests attracted celebrity hosts, judges and conductors. By 1959, Songfest was billed as the largest collegiate musicale in America. Today Songfest is an established tradition, and music remains integral to USC. With an abundance of extracurricular and course-related musical activities, the university continues to build upon it rich musical heritage, creating both a sound track and a focal point for campus life. 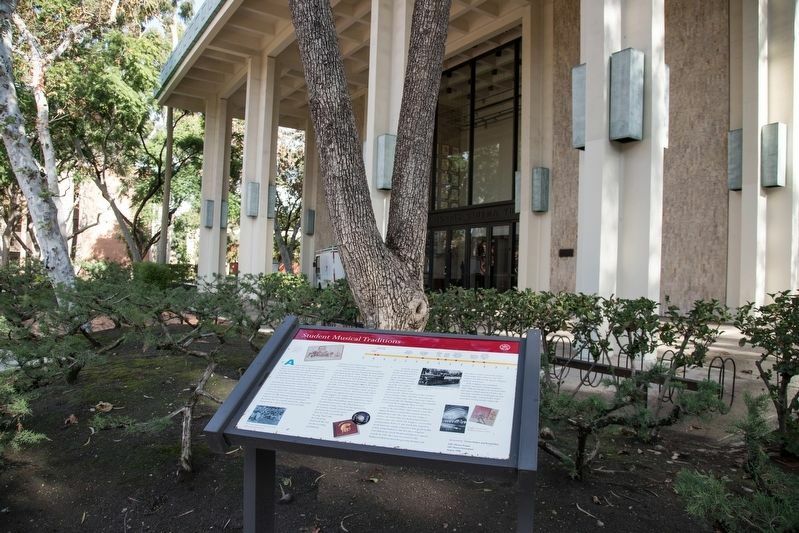 Erected 1998 by USC History Project, USC General Alumni Association. Sponsored by L’Cena, Robert and Ronald Rice. Location. 34° 1.322′ N, 118° 17.131′ W. Marker is in Los Angeles, California, in Los Angeles County. Marker can be reached from West 34th Street. Touch for map. Is it on the walkway just west of Queens Courtyard between the Norris Theatre and the Annenberg School for Communications. Marker is in this post office area: Los Angeles CA 90089, United States of America. Touch for directions. Other nearby markers. At least 8 other markers are within walking distance of this marker. Ceasar Estrada Chavez (within shouting distance of this marker); The Founding of USC (about 300 feet away, measured in a direct line); A Changing Campus (about 300 feet away); The Trojan Column (about 400 feet away); First Meeting of the USC Board of Trustees (about 400 feet away); Love Affair with the Movies (about 400 feet away); An International University (about 400 feet away); Campus Life (about 400 feet away). Touch for a list and map of all markers in Los Angeles. More about this marker. 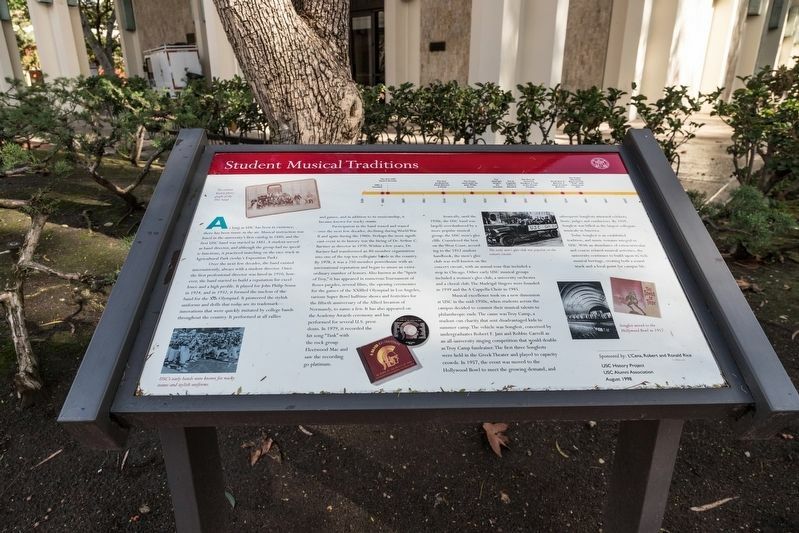 This panel shows a timeline from 1870 to 2000 marking when USC was founded, the first USC band was formed, the first professional band director was hired, the Trojan band played for John Philip Sousa, the Madrigal Singers were founded, the A Cappella Choir was founded, the first all-university Songfest was held at the Greek Theater, Dr. Arthur C. Bartner was hired as band director and the Trojan Marching Band records “Tusk” with Fleetwood Mac. More. Search the internet for Student Musical Traditions. Credits. This page was last revised on March 5, 2019. This page originally submitted on February 27, 2019, by J. J. Prats of Powell, Ohio. This page has been viewed 54 times since then. Last updated on March 2, 2019, by Craig Baker of Sylmar, California. Photos: 1, 2. submitted on February 27, 2019, by J. J. Prats of Powell, Ohio.